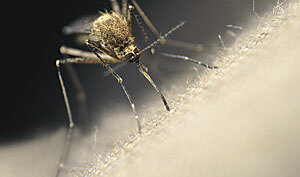 Mosquitoes are one of the deadliest animals in the world. They are responsible for killing several million people each year, according to the World Health Organization. As vectors of parasites, bacteria, and viruses, they transmit hundreds of millions of cases of malaria, dengue, yellow fever, West Nile virus, Zika virus, and other diseases from one human or animal host to another. Across the United States, vector control districts employ skilled and dedicated staff members to help reduce the mosquito population. They conduct site inspections; place traps; treat breeding sites with mosquitocide; and, if necessary, fog (spraying pesticides throughout an area) adult populations. Santa Cruz County's Mosquito Abatement and Vector Control (MAVC) started using GIS almost 20 years ago to identify probable breeding sites. Since then, MAVC has progressively implemented more of the ArcGIS platform to keep its operations effective and innovative. Now, staff members are continually informed of the status of population control projects and can better focus their mosquito abatement work. A mosquito undergoes four life cycle stages: egg, larva, pupa, and adult. Females deposit their eggs in moist soil or places with standing water, such as ponds, septic systems, wetlands, ditches, storm water catch basins, and various containers. Once they reach adulthood, mosquitoes can fly three or more miles—depending on the species—making it difficult to get a handle on them. Controlling mosquitoes when they are larvae is the most effective way to reduce populations before they disperse. California began employing mosquito controls in the early twentieth century to restrict salt marsh mosquitoes around San Francisco Bay and combat malaria in the state's Central Valley. By the 1990s, almost every county in California had formed a vector control district. Santa Cruz County, located approximately 60 miles south of San Francisco, is composed of pristine beaches and wetlands, lush redwood forests, and rich farmland. More than 14 species of mosquitoes call Santa Cruz County home, and the resources required to control the populations are significant. In 1998—five years after it was formed—MAVC began employing GIS to locate potential mosquito breeding sites based on ground conditions and proximity to bodies of water. The district developed GIS layers to show where standing water was located to help identify the breeding sites. The size of each breeding area was either calculated using aerial imagery or estimated at the time of treatment. This helped determine how much mosquitocide to administer and where. Santa Cruz County's Mosquito Abatement and Vector Control district now distributes site inspection status information via its Operations Map app. The field data—which included the type and amount of mosquitocide applied, the application date, the area treated, and the current condition of the site—was entered into a Microsoft Access treatment database. To date, more than 2,500 potential breeding sites have been mapped and are inspected every other week or each month. In 2004, to stay ahead of mosquitoes moving into adulthood, MAVC had the Santa Cruz County GIS team develop the Mosquito Button, a geoprocessing script for ArcMap that was used to automatically determine the inspection status of potential breeding sites. "Mosquito problems can accrue quickly, and our department needed some way to visually see when we've been to a mosquito source," said MAVC vector control specialist Ray Travers. "The Mosquito Button provided a quick and easy way for staff to look at the inspection status of possible mosquito breeding sites." Pressing the button initiated a query of the treatment database to find the last treatment date and the effective life of the mosquitocide that was used. The inspection sites then appeared color-coded in ArcGIS for Desktop, with red meaning a site needed inspection or treatment, yellow indicating that a site was coming up for inspection within ten days, and green meaning no action was required. The quick, visual reference provided by the Mosquito Button helped staff members plan their daily work activities by letting them see where inspections and treatments needed to take place within their assigned areas. But because the department had minimal resources and integrating the Microsoft Access-based treatment database with ArcMap was challenging, staff members saved copies of the GIS data locally, on their computers. This led to fragmented GIS datasets and made it difficult to get a countywide picture of mosquito populations. 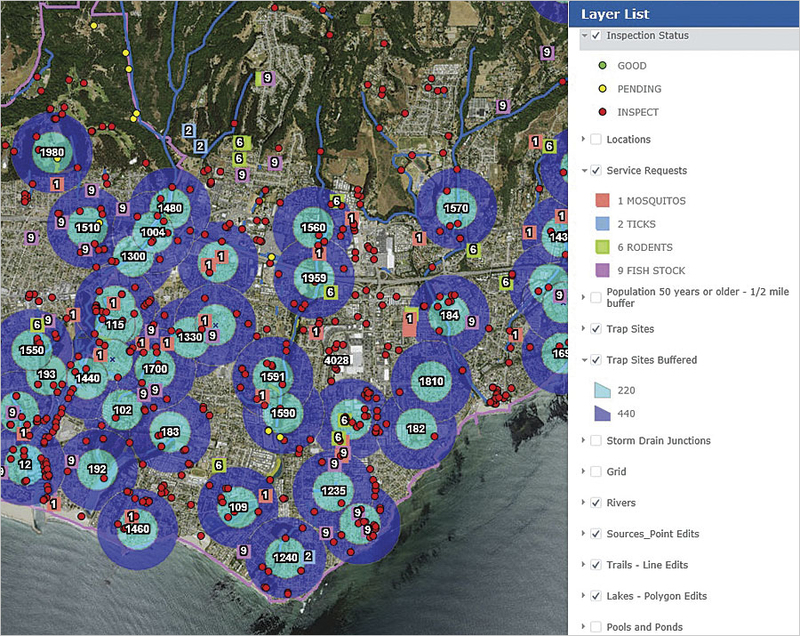 In 2014, MAVC staff moved the treatment data to Microsoft's SQL Server, which allowed the GIS data to be taken off people's desktops and put into ArcGIS Online. MAVC also replaced the Mosquito Button with a SQL-stored procedure that runs nightly to calculate site inspection statuses. 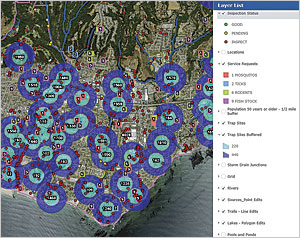 This data is published as a REST service in ArcGIS for Server and shared with a Vector Control group in ArcGIS Online. 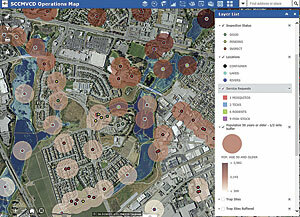 It is distributed via the MAVC Operations Map app, which was developed with Web AppBuilder for ArcGIS. The status data for every mosquito-breeding site in Santa Clara County is now available to all users anywhere, anytime—on their desktops and their mobile devices. The MAVC Operations Map app also contains tools that allow users to edit data, conduct spatial analysis, and measure distances and areas. Staff use ArcGIS Online to view demographic information, together with mosquito treatment and trapping locations, so they can prioritize their resources. Beyond basic mapping functions, the ArcGIS Online platform provides MAVC with tools to identify and protect segments of the population that are most vulnerable to disease, such as children and the elderly. MAVC field staff use ArcGIS Online to create buffers around treatment and trapping locations. They then assign demographic information, such as total population and median age, to the buffers. Seeing all this information together allows staff members to prioritize their time and resources by giving them a better understanding of where vulnerable segments of the population are located. The buffers also help them identify potential breeding sites. For example, if high numbers of a target mosquito species are found in a trap, there's a chance a potential breeding site has been missed or that the treatment has failed. From there, staff could create a quarter-mile buffer around the trap and select the sites within the buffer that may need to be revisited for inspection or treated again. Additionally, MAVC began leveraging Collector for ArcGIS toward the end of 2015 to map new breeding sites and trapping locations, as well as update known breeding sites with exact measurements. Now, instead of recording data in the office after they conduct site visits, staff members capture information in real time. They use Collector to measure the area of a site during an inspection or at the time of treatment so a precise amount of mosquitocide can be applied. Field staff also use it to map the trails that lead to particular breeding sites so that, on return visits, they can take the best route and avoid nettlesome conditions such as poison oak. MAVC is also in the process of implementing Navigator for ArcGIS to develop safe and efficient routes for getting to residential mosquito breeding sites. The district treats more than 1,600 storm water catch basins in the county several times a year, and planning the best routes to get to all of them can be time consuming—especially when a staff member has to visit 70–80 in one day. In some cases, MAVC employs seasonal workers to treat the catch basins, which can add to the complexity if they are not familiar with the area. Using Navigator will reduce everyone's travel times, resulting in savings on gas and decreased vehicle wear and tear. 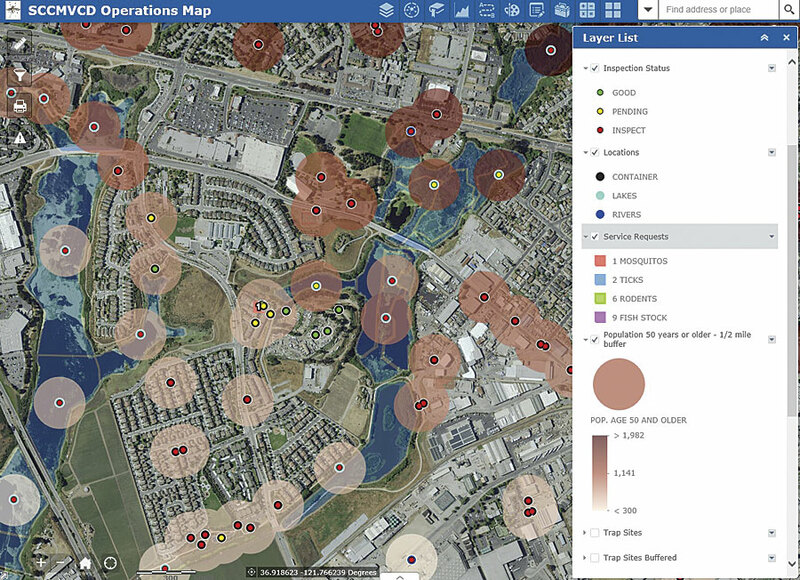 The department is looking to implement Operations Dashboard for ArcGIS, Esri Story Map apps, time-enabled layers, and ArcGIS for Open Data as well. "This is just the beginning," said Travers. "We intend to capitalize on all the features of ArcGIS Online…allowing us to be most effective at our jobs while keeping the public and our colleagues abreast of our actions and the actions of the mosquito." For more information, email Bryan Kriete, vector control technician for Santa Cruz County.